Goguryeo (고구려; 高句麗; [ko.ɡu.ɾjʌ], 37 BCE[note 1]–668 CE), also called Goryeo (고려; 高麗; [ko.ɾjʌ]), was a Korean kingdom located in the northern and central parts of the Korean Peninsula and the southern and central parts of Manchuria. At its peak of power, Goguryeo controlled most of the Korean peninsula, large parts of Manchuria and parts of the Russian Far East and eastern Mongolia. Along with Baekje and Silla, Goguryeo was one of the Three Kingdoms of Korea. It was an active participant in the power struggle for control of the Korean peninsula and was also associated with the foreign affairs of neighboring polities in China and Japan. The Samguk sagi, a 12th-century text from Goryeo, indicates that Goguryeo was founded in 37 BCE by Jumong (Hangul: 주몽; Hanja: 朱蒙), a prince from Buyeo, who was enthroned as Dongmyeong. Goguryeo was one of the great powers in East Asia, until its defeat by a Silla–Tang alliance in 668 after prolonged exhaustion and internal strife caused by the death of Yeon Gaesomun. After its fall, its territory was divided among the states of Later Silla and Balhae. The name Goryeo (alternately spelled Koryŏ), a shortened form of Goguryeo (Koguryŏ), was adopted as the official name in the 5th century, and is the origin of the English name "Korea". In the geographic monographs of the Book of Han, the word Goguryeo (hanja: 高句驪) made its first appearance in 113 BCE in the name of Gaogouli County under the jurisdiction of Xuantu Commandery. In the Old Book of Tang (945), it is recorded that Emperor Taizong refers to Goguryeo's history as being some 900 years old. According to the 12th-century Samguk sagi and the 13th-century Samgungnyusa, a prince from the Buyeo kingdom named Jumong fled after a power struggle with other princes of the court and founded Goguryeo in 37 BCE in a region called Jolbon Buyeo, usually thought to be located in the middle Yalu and Tongjia River basin, overlapping the current China-North Korea border. In 75 BCE, a group of Yemaek who may have originated from Goguryeo made an incursion into China's Xuantu Commandery west of the Yalu. However, the weight of textual evidence from the Old Book of Tang, New Book of Tang, the Samguk sagi, the Nihon Shoki as well as other ancient sources would support a 37 BCE or "middle" first century BCE foundation date for Goguryeo. Archaeological evidence would support centralized groups of Yemaek tribes in the 2nd century BC, but there is no direct evidence that would suggest these Yemaek groups were known as or would identify themselves as Goguryeo. The first mention of Goguryeo as a group label associated with Yemaek tribes is a reference in the Han Shu that discusses a Goguryeo revolt in 12 CE, during which they broke away from the influence of the Chinese at Xuantu. At its founding, the Goguryeo people are believed to be a blend of people from Buyeo and Yemaek, as leadership from Buyeo may have fled their kingdom and integrated with existing Yemaek chiefdoms. The Records of the Three Kingdoms, in the section titled "Accounts of the Eastern Barbarians", implied that Buyeo and the Yemaek people were ethnically related and spoke a similar language. Both Goguryeo and Baekje shared founding myths and originated from Buyeo. 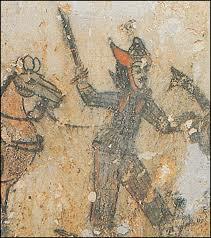 Image of the mythical figure from the Goguryeo-era Ohoe Tomb 4. The earliest mention of Jumong is in the 4th-century Gwanggaeto Stele. Jumong is the modern Korean transcription of the hanja 朱蒙 Jumong, 鄒牟 Chumo, or 仲牟 Jungmo. The Stele states that Jumong was the first king and ancestor of Goguryeo and that he was the son of the prince of Buyeo and daughter of Habaek (Hangul: 하백; Hanja: 河伯), the god of the Amnok River or, according to an alternate interpretation, the sun god Haebak (Hangul: 해밝). The Samguk sagi and Samgungnyusa paint additional detail and names Jumong's mother as Yuhwa (Hangul: 유화; Hanja: 柳花). Jumong's biological father was said to be a man named Haemosu (Hangul: 해모수; Hanja: 解慕漱) who is described as a "strong man" and "a heavenly prince." The river god chased Yuhwa away to the Ubal River (Hangul: 우발수; Hanja: 優渤水) due to her pregnancy, where she met and became the concubine of Geumwa. Jumong was well known for his exceptional archery skills. Eventually, Geumwa's sons became jealous of him, and Jumong was forced to leave Eastern Buyeo. The Stele and later Korean sources disagree as to which Buyeo Jumong came from. The Stele says he came from Buyeo and the Samgungnyusa and Samguk sagi say he came from Eastern Buyeo. Jumong eventually made it to Jolbon, where he married Soseono, daughter of its ruler. He subsequently became king himself, founding Goguryeo with a small group of his followers from his native country. A traditional account from the "Annals of Baekje" section in the Samguk sagi says that Soseono was the daughter of Yeon Tabal, a wealthy influential figure in Jolbon and married to Jumong. However, the same source officially states that the king of Jolbon gave his daughter to Jumong, who had escaped with his followers from Eastern Buyeo, in marriage. She gave her husband, Jumong, financial support in founding the new statelet, Goguryeo. After Yuri, son of Jumong and his first wife, Lady Ye, came from Dongbuyeo and succeeded Jumong, she left Goguryeo, taking her two sons Biryu and Onjo south to found their own kingdoms, one of which was Baekje. Jumong's given surname was "Hae" (Hangul: 해; Hanja: 解), the name of the Buyeo rulers. According to the Samgungnyusa, Jumong changed his surname to "Go" (Hangul: 고; Hanja: 高) in conscious reflection of his divine parentage. Jumong is recorded to have conquered the tribal states of Biryu (Hangul: 비류국; Hanja: 沸流國) in 36 BCE, Haeng-in (Hangul: 행인국; Hanja: 荇人國) in 33 BCE, and Northern Okjeo in 28 BCE. Goguryeo developed from a league of various Yemaek tribes to an early state and rapidly expanded its power from their original basin of control in the Hun River drainage. In the time of Taejodae in 53 CE, five local tribes were reorganized into five centrally ruled districts. Foreign relations and the military were controlled by the king. Early expansion might be best explained by ecology; Goguryeo controlled territory in what is currently central and southern Manchuria and northern Korea, which are both very mountainous and lacking in arable land. Upon centralizing, Goguryeo might have been unable to harness enough resources from the region to feed its population and thus, following historical pastoralist tendencies, would have sought to raid and exploit neighboring societies for their land and resources. Aggressive military activities may have also aided expansion, allowing Goguryeo to exact tribute from their tribal neighbors and dominate them politically and economically. Taejo conquered the Okjeo tribes of what is now northeastern Korea as well as the Dongye and other tribes in Southeastern Manchuria and Northern Korea. From the increase of resources and manpower that these subjugated tribes gave him, Taejodae led Goguryeo in attacking the Han Commanderies of Lelang and Xuantu in the Korean and Liaodong Peninsulas, becoming fully independent from them. Generally, Taejodae allowed the conquered tribes to retain their chieftains, but required them to report to governors who were related to Goguryeo's royal line; tribes under Goguryeo's jurisdiction were expected to provide heavy tribute. Taejodae and his successors channeled these increased resources to continuing Goguryeo's expansion to the north and west. New laws regulated peasants and the aristocracy, as tribal leaders continued to be absorbed into the central aristocracy. Royal succession changed from fraternal to patrilineal, stabilizing the royal court. The expanding Goguryeo kingdom soon entered into direct military contact with the Liaodong commandery to its west. Pressure from Liaodong forced Goguryeo to move their capital in the Hun River valley to the Yalu River valley near Hwando. When Liaodong was finally conquered by Wei, cooperation between Wei and Goguryeo fell apart and Goguryeo attacked the western edges of Liaodong, which incited a Wei counterattack in 244. Thus, Goguryeo initiated the Goguryeo–Wei War in 242, trying to cut off Chinese access to its territories in Korea by attempting to take a Chinese fort. However, the Wei state responded by invading and defeated Goguryeo. The capital at Hwando was destroyed by Wei forces in 244. It is said that Dongcheon, with his army destroyed, fled for a while to the Okjeo state in the east. Wei invaded again in 259 but was defeated at Yangmaenggok; according to the Samguk sagi, Jungcheon assembled 5,000 elite cavalry and defeated the invading Wei troops, beheading 8,000 enemies. Seated buddhas and bodhisattvas from Wono-ri, Goguryeo. A gilt-bronze crown from Goguryeo believed to have once adorned the head of a bodhisattva image. In only 70 years, Goguryeo rebuilt its capital Hwando and again began to raid the Liaodong, Lelang and Xuantu commandaries. As Goguryeo extended its reach into the Liaodong Peninsula, the last Chinese commandery at Lelang was conquered and absorbed by Micheon in 313, bringing the remaining northern part of the Korean peninsula into the fold. This conquest resulted in the end of Chinese rule over territory in the northern Korean peninsula, which had spanned 400 years. From that point on, until the 7th century, territorial control of the peninsula would be contested primarily by the Three Kingdoms of Korea. Goguryeo met major setbacks and defeats during the reign of Gogukwon in the 4th century. In the early 4th century, the nomadic proto-Mongol Xianbei people occupied northern China; during the winter of 342, the Xianbei of Former Yan, ruled by the Murong clan, attacked and destroyed Goguryeo's capital, Hwando, capturing 50,000 Goguryeo men and women to use as slave labor in addition to taking the Queen Dowager and Queen prisoner, and forced Gogukwon to flee for a while. The Xianbei also devastated Buyeo in 346, accelerating Buyeo migration to the Korean peninsula. In 371, Geunchogo of Baekje killed Gogukwon in the Battle of Chiyang and sacked Pyongyang, one of Goguryeo's largest cities. Sosurim, who succeeded the slain Gogukwon, reshaped the nation's institutions to save it from a great crisis. Turning to domestic stability and the unification of various conquered tribes, Sosurim proclaimed new laws, embraced Buddhism as the state religion in 372, and established a national educational institute called the Taehak (Hangul: 태학; Hanja: 太學). Due to the defeats that Goguryeo had suffered at the hands of the Xianbei and Baekje, Sosurim instituted military reforms aimed at preventing such defeats in the future. Sosurim's internal arrangements laid the groundwork for Gwanggaeto's expansion. His successor and the father of Gwanggaeto the Great, Gogukyang, invaded Later Yan, the successor state of Former Yan, in 385 and Baekje in 386. Goguryeo used its military to protect and exploit semi-nomadic peoples, who served as vassals, foot soldiers, or slaves, such as the Okjeo people in the northeast end of the Korean peninsula, and the Mohe people in Manchuria, who would later become the Jurchens. Detail of a rubbing of the Gwanggaeto Stele (414 AD), one of the few surviving records made by Goguryeo, written in Classical Chinese. A royal tomb, located in Ji'an, Jilin, was built by the Goguryeo Kingdom. Goguryeo experienced a golden age under Gwanggaeto the Great and his son Jangsu. During this period, Goguryeo territories included three fourths of the Korean Peninsula, including what is now Seoul, almost all of Manchuria, parts of Inner Mongolia, and parts of Russia. There is archaeological evidence that Goguryeo's maximum extent lay even further west in present-day Mongolia, based on discoveries of Goguryeo fortress ruins in Mongolia. Gwanggaeto the Great (r. 391–412) was a highly energetic emperor who is remembered for his rapid military expansion of the realm. He instituted the era name of Yeongnak or Eternal Rejoicing, affirming that Goguryeo was on equal standing with the dynasties in the Chinese mainland. Gwanggaeto conquered 64 walled cities and 1,400 villages during his campaigns. To the west, he destroyed neighboring Khitan tribes and invaded Later Yan, conquering the entire Liaodong Peninsula; to the north and east, he annexed much of Buyeo and conquered the Sushen, who were Tungusic ancestors of the Jurchens and Manchus; and to the south, he defeated and subjugated Baekje, contributed to the dissolution of Gaya, and vassalized Silla after defending it from a coalition of Baekje, Gaya, and Wa. Gwanggaeto brought about a loose unification of the Korean Peninsula, and achieved undisputed control of most of Manchuria and over two thirds of the Korean Peninsula. Gwanggaeto's exploits were recorded on a huge memorial stele erected by his son Jangsu, located in present-day Ji'an on the border between China and North Korea. Jangsu (r. 413–491) ascended to the throne in 413 and moved the capital in 427 to Pyongyang, a more suitable region to grow into a burgeoning metropolitan capital, which led Goguryeo to achieve a high level of cultural and economic prosperity. Jangsu, like his father, continued Goguryeo's territorial expansion into Manchuria and reached the Songhua River to the north. He invaded the Khitans, and then attacked the Didouyu, located in eastern Mongolia, with his Rouran allies. Like his father, Jangsu also achieved a loose unification of the Three Kingdoms of Korea. He defeated Baekje and Silla and gained large amounts of territory from both. In addition, Jangsu's long reign saw the perfecting of Goguryeo's political, economic and other institutional arrangements. Jangsu ruled Goguryeo for 79 years until the age of 98, the longest reign in East Asian history. During the reign of Munja, Goguryeo completely annexed Buyeo, signifying Goguryeo's furthest-ever expansion north, while continuing its strong influence over the kingdoms of Silla and Baekje, and the tribes of Wuji and Khitan. Goguryeo reached its zenith in the 6th century. After this, however, it began a steady decline. Anjang was assassinated, and succeeded by his brother Anwon, during whose reign aristocratic factionalism increased. A political schism deepened as two factions advocated different princes for succession, until the eight-year-old Yang-won was finally crowned. But the power struggle was never resolved definitively, as renegade magistrates with private armies appointed themselves de facto rulers of their areas of control. Taking advantage of Goguryeo's internal struggle, a nomadic group called the Tuchueh attacked Goguryeo's northern castles in the 550s and conquered some of Goguryeo's northern lands. Weakening Goguryeo even more, as civil war continued among feudal lords over royal succession, Baekje and Silla allied to attack Goguryeo from the south in 551. In 551 AD, Baekje and Silla entered into an alliance to attack Goguryeo and conquer the Han River valley, an important strategic area close to the center of the peninsula and a very rich agricultural region. After Baekje exhausted themselves with a series of costly assaults on Goguryeo fortifications, Silla troops, arriving on the pretense of offering assistance, attacked and took possession of the entire Han River valley in 553. Incensed by this betrayal, Seong launched a retaliatory strike against Silla's western border in the following year but was captured and killed. The war, along the middle of the Korean peninsula, had very important consequences. It effectively made Baekje the weakest player on the Korean Peninsula and gave Silla an important resource and population rich area as a base for expansion. Conversely, it denied Goguryeo the use of the area, which weakened the kingdom. It also gave Silla direct access to the Yellow Sea, opening up direct trade and diplomatic access to the Chinese dynasties and accelerating Silla's adoption of Chinese culture. Thus, Silla could rely less on Goguryeo for elements of civilization and could get culture and technology directly from China. This increasing tilt of Silla to China would result in an alliance that would prove disastrous for Goguryeo in the late 7th century. Goguryeo's expansion conflicted with Sui China and increased tensions. In 598, Goguryeo made a preemptive attack on Liaoxi, leading Emperor Wen to launch a counterattack by land and sea that ended in disaster for Sui. Sui's most disastrous campaign against Goguryeo was in 612, in which Sui, according to the History of the Sui Dynasty, mobilized 30 Division armies, about 1,133,800 combat troops. Pinned along Goguryeo's line of fortifications on the Liao River, a detachment of nine division armies, about 305,000 troops, bypassed the main defensive lines and headed towards the Goguryeo capital of Pyongyang to link up with Sui naval forces, who had reinforcements and supplies. However, Goguryeo was able to defeat the Sui navy, thus when the Sui's nine division armies finally reached Pyongyang, they didn't have the supplies for a lengthy siege. Sui troops retreated, but General Eulji Mundeok led the Goguryeo troops to victory by luring the Sui into an ambush outside of Pyongyang. At the Battle of Salsu, Goguryeo soldiers released water from a dam, which split the Sui army and cut off their escape route. Of the original 305,000 soldiers of Sui's nine division armies, it is said that only 2,700 escaped to Sui China. The 613 and 614 campaigns were aborted after launch—the 613 campaign was terminated when the Sui general Yang Xuangan rebelled against Emperor Yang, while the 614 campaign was terminated after Goguryeo offered a truce and returned Husi Zheng (斛斯政), a defecting Sui general who had fled to Goguryeo, Emperor Yang later had Husi executed. Emperor Yang planned another attack on Goguryeo in 615, but due to Sui's deteroriating internal state he was never able to launch it. Sui was weakened due to rebellions against Emperor Yang's rule and his failed attempts to conquer Goguryeo. They could not attack further because the provinces in the Sui heartland would not send logistical support. Emperor Yang's disastrous defeats in Korea greatly contributed to the collapse of the Sui dynasty. First campaign in the Goguryeo–Tang War. In the winter of 642, King Yeongnyu was apprehensive about Yeon Gaesomun, one of the great nobles of Goguryeo, and plotted with other officials to kill him. However, Yeon Gaesomun caught news of the plot and killed Yeongnyu and 100 officials, initiating a coup d'état. He proceeded to enthrone Yeongnyu's nephew, Go Jang, as King Bojang while wielding de facto control of Goguryeo himself as the generalissimo ((in Korean)). Yeon Gaesomun took an increasingly provocative stance against Silla and Tang China. In 643, under pressure from the Goguryeo–Baekje alliance, Silla requested military aid from Tang. In 644, Tang began preparations for a major campaign against Goguryeo. In 645, Emperor Taizong, who had a personal ambition to defeat Goguryeo and was determined to succeed where Emperor Yang had failed, personally led an attack on Goguryeo. The Tang army captured a number of Goguryeo fortresses, including the important Yodong/Liaodong Fortress (遼東城, in modern Liaoyang, Liaoning), and defeated large Goguryeo armies in its path. Ansi City (in modern Haicheng, Liaoning) was the last fortress that would clear the Liaodong Peninsula of significant defensive works and was promptly put under siege. However, the capable defense put up by Ansi's commanding general (whose name is controversial but traditionally is believed to be Yang Manchun) stymied Tang forces and, in late fall, with winter fast approaching and his supplies running low, Emperor Taizong withdrew. The campaign was unsuccessful for the Tang Chinese, failing to capture Ansi Fortress after a protracted siege that lasted more than 60 days. Emperor Taizong invaded Goguryeo again in 647 and 648, but was defeated both times. Emperor Taizong prepared another invasion in 649, but died in the summer, possibly due to an illness he contracted during his Korean campaigns. His son Emperor Gaozong continued his campaigns. Upon the suggestion of Kim Chunchu, the Silla–Tang alliance first conquered Baekje in 660 to break up the Goguryeo–Baekje alliance, and then turned its full attention to Goguryeo. However, Emperor Gaozong, too, was unable to defeat Goguryeo led by Yeon Gaesomun; one of Yeon Gaesomun's most notable victories came in 662 at the Battle of Sasu (蛇水), where he annihilated the Tang forces and killed the invading general Pang Xiaotai (龐孝泰) and all 13 of his sons. Therefore, while Yeon Gaesomun was alive, Tang could not defeat Goguryeo. In the summer of 666, Yeon Gaesomun died of a natural cause and Goguryeo was thrown into chaos and weakened by a succession struggle among his sons and younger brother. He was initially succeeded as Dae Mangniji, the highest position newly made under the ruling period of Yeon Gaesomun, by his oldest son Yeon Namsaeng. As Yeon Namsaeng subsequently carried out a tour of Goguryeo territory, however, rumors began to spread both that Yeon Namsaeng was going to kill his younger brothers Yeon Namgeon and Yeon Namsan, whom he had left in charge at Pyongyang, and that Yeon Namgeon and Yeon Namsan were planning to rebel against Yeon Namsaeng. When Yeon Namsaeng subsequently sent officials close to him back to Pyongyang to try to spy on the situation, Yeon Namgeon arrested them and declared himself Dae Mangniji, attacking his brother. Yeon Namsaeng sent his son Cheon Heonseong (泉獻誠), as Yeon Namsaeng changed his family name from Yeon (淵) to Cheon (泉) observe naming taboo for Emperor Gaozu, to Tang to seek aid. Emperor Gaozong saw this as an opportunity and sent an army to attack and destroy Goguryeo. In the middle of Goguryeo's power struggles between Yeon Gaesomun's successors, his younger brother, Yeon Jeongto, defected to the Silla side. In 667, the Chinese army crossed the Liao River and captured Shin/Xin Fortress (新城, in modern Fushun, Liaoning). The Tang forces thereafter fought off counterattacks by Yeon Namgeon, and joined forces with and received every possible assistance from the defector Yeon Namsaeng, although they were initially unable to cross the Yalu River due to resistance. In spring of 668, Li Ji turned his attention to Goguryeo's northern cities, capturing the important city of Buyeo (扶餘, in modern Nong'an, Jilin). In fall of 668, he crossed the Yalu River and put Pyongyang under siege in concert with the Silla army. Yeon Namsan and Bojang surrendered, and while Yeon Namgeon continued to resist in the inner city, his general, the Buddhist monk Shin Seong (信誠) turned against him and surrendered the inner city to Tang forces. Yeon Namgeon tried to commit suicide, but was seized and treated. This was the end of Goguryeo, and Tang annexed Goguryeo into its territory, with Xue Rengui being put initially in charge of former Goguryeo territory as protector general. The violent dissension resulting from Yeon Gaesomun's death proved to be the primary reason for the Tang–Silla triumph, thanks to the division, defections, and widespread demoralization it caused. The alliance with Silla had also proved to be invaluable, thanks to the ability to attack Goguryeo from opposite directions, and both military and logistical aid from Silla. However, there was much resistance to Tang rule (fanned by Silla, which was displeased that Tang did not give it Goguryeo or Baekje's territory), and in 669, following Emperor Gaozong's order, a part of the Goguryeo people were forced to move to the region between the Yangtze River and the Huai River, as well as the regions south of the Qinling Mountains and west of Chang'an, only leaving old and weak inhabitants in the original land. Some people entered the service of the Tang government, such as Go Sagye and his son Gao Xianzhi (Go Seonji in Korean), the famed general who commanded the Tang forces at the Battle of Talas. Silla thus unified most of the Korean peninsula in 668, but the kingdom's reliance on China's Tang Dynasty had its price. Tang set up the Protectorate General to Pacify the East, governed by Xue Rengui, but faced increasing problems ruling the former inhabitants of Goguryeo, as well as Silla's resistance to Tang's remaining presence on the Korean Peninsula. Silla had to forcibly resist the imposition of Chinese rule over the entire peninsula, which lead to the Silla–Tang Wars, but their own strength did not extend beyond the Taedong River. After the fall of Goguryeo in 668, many Goguryeo people rebelled against the Tang and Silla by starting Goguryeo revival movements. Among these were Geom Mojam, Dae Jung-sang, and several famous generals. The Tang Dynasty tried but failed to establish several commanderies to rule over the area. In 677, Tang crowned Bojang as the "King of Joseon" and put him in charge of the Liaodong commandery of the Protectorate General to Pacify the East. However, Bojang continued to foment rebellions against Tang in an attempt to revive Goguryeo, organizing Goguryeo refugees and allying with the Mohe tribes. He was eventually exiled to Sichuan in 681, and died the following year. The Protectorate General to Pacify the East was installed by the Tang government to rule and keep control over the former territories of the fallen Goguryeo. It was first put under the control of Tang General Xue Rengui, but was later replaced by Bojang due the negative responses of the Goguryeo people. Bojang was sent into exile for assisting Goguryeo revival movements, but was succeeded by his descendants. Bojang's descendants declared independence from Tang during the same period as the An Lushan Rebellion and Li Zhengji (Yi Jeong-gi in Korean)'s rebellion in Shandong. The Protectorate General to Pacify the East was renamed "Little Goguryeo" until its eventual absorption into Balhae under the reign of Seon. Geom Mojam and Anseung rose briefly at the Han Fortress (한성, 漢城, in modern Chaeryong, South Hwanghae), but failed, when Anseung surrendered to Silla. Go Anseung ordered the assassination of Geom Mojam, and defected to Silla, where he was given a small amount of land to rule over. There, Anseung established the State of Bodeok (보덕, 報德), incited a rebellion, which was promptly crushed by Sinmun. Anseung was then forced to reside in the Silla capital, given a Silla bride and had to adopt the Silla Royal surname of "Kim." Dae Jung-sang and his son Dae Jo-yeong, both former Goguryeo generals, regained most of Goguryeo's northern land after its downfall in 668, established the Kingdom of Jin (진, 震), which was renamed to Balhae after 713. To the south of Balhae, Silla controlled the Korean peninsula south of the Taedong River, and Manchuria (present-day northeastern China) was conquered by Balhae. Balhae considered itself (particularly in diplomatic correspondence with Japan) a successor state of Goguryeo. In 901, the general Gung Ye rebelled against Later Silla and founded Later Goguryeo (renamed to Taebong in 911), which considered itself to be a successor of Goguryeo. Later Goguryeo originated in the northern regions, including Songak (modern Kaesong), which were the strongholds of Goguryeo refugees. Later Goguryeo's original capital was established in Songak, the hometown of Wang Geon, a prominent general under Gung Ye. Wang Geon was a descendant of Goguryeo and traced his ancestry to a noble Goguryeo clan. In 918, Wang Geon overthrew Gung Ye and established Goryeo, as the successor of Goguryeo, and laid claim to Manchuria as Goryeo's rightful legacy. Wang Geon unified the Later Three Kingdoms in 936, and Goryeo ruled the Korean Peninsula until 1392. In the 10th century, Balhae collapsed and much of its ruling class and the last crown prince Dae Gwang-hyeon fled to Goryeo. The Balhae refugees were warmly welcomed and included in the ruling family by Wang Geon, who felt a strong familial kinship with Balhae, thus unifying the two successor nations of Goguryeo. Goguryeo was a highly militaristic state. Goguryeo has been described as an empire by Korean scholars. Initially, there were four partially autonomous districts based on the cardinal directions, and a central district led by the monarch; however, in the first century the cardinal districts became centralized and administrated by the central district, and by the end of the 3rd century, they lost all political and military authority to the monarch. In the 4th century, after suffering defeats against the Xianbei and Baekje during the reign of Gogukwon, Sosurim instituted military reforms that paved the way for Gwanggaeto's conquests. During its height, Goguryeo was able to mobilize 300,000 troops. Goguryeo often enlisted semi-nomadic vassals, such as the Mohe people, as foot soldiers. Every man in Goguryeo was required to serve in the military, or could avoid conscription by paying extra grain tax. A Tang treatise of 668 records a total of 675,000 displaced personnel and 176 military garrisons after the surrender of Bojang. The main projectile weapon used in Goguryeo was the bow. The bows were modified to be more composite and increase throwing ability on par with crossbows. To a lesser extent, stone-throwing machines and crossbows were also used. Polearms, used against the cavalry and in open order, were mostly spears. Two types of swords were used by Goguryeo warriors. The first was a shorter double-edged variant mostly used for throwing. The other was longer single-edged sword with minimal hilt and ring pommel, of eastern Han influence. The helmets were similar to helmets used by Central Asian peoples, decorated with wings, leathers and horsetails. The shield was the main protection, which covered most of the soldier's body. The cavalry were called Gaemamusa (개마무사, 鎧馬武士), and similar in type to the Cataphract. Goguryeo used a sword called Hwandudaedo. It looks like the sword drawing in the following picture which is 2000 years old from an old Goguryeo tomb. As Korean swords changed from bronze age to iron age, the sword shapes changed. There are many archaeological finds on ancient Korean iron swords particularly the swords with a ring at the end. The most common form of the Goguryeo fortress was one made in the shape of the moon, located between a river and its tributary. Ditches and ground walls between the shores formed an extra defense line. The walls were extensive in their length, and they were constructed from huge stone blocks fixed with clay, and even Chinese artillery had difficulty to break through them. Walls were surrounded by a ditch to prevent an underground attack, and equipped with guard towers. All fortresses had sources of water and enough equipment for a protracted siege. If rivers and mountains were absent, extra defense lines were added. Two hunts per year, led by the king himself, maneuvers exercises, hunt-maneuvers and parades were conducted to give the Goguryeo soldier a high level of individual training. There were five armies in the capital, mostly cavalry that were personally led by the king, numbering approximately 12,500. Military units varied in number from 21,000 to 36,000 soldiers, were located in the provinces, and were led by the governors. Military colonies near the boundaries consisted mostly of soldiers and peasants. There were also private armies held by aristocrats. This system allowed Goguryeo to maintain and utilize an army of 50,000 without added expense, and 300,000 through large mobilization in special cases. Goguryeo units were divided according to major weapons: spearmen, axemen, archers composed of those on foot and horseback, and heavy cavalry that included armored and heavy spear divisions. Other groups like the catapult units, wall-climbers, and storm units were part of the special units and were added to the common. The advantage of this functional division is highly specialized combat units, while the disadvantage is that it was impossible for one unit to make complex, tactical actions. The military formation had the general and his staff with guards in the middle of the army. The archers were defended by axemen. In front of the general were the main infantry forces, and on the flanks were rows of heavy cavalry ready to counterattack in case of a flank attack by the enemy. In the very front and rear was the light cavalry, used for intelligence, pursuit, and for weakening the enemy's strike. Around the main troops were small groups of heavy cavalrymen and infantry. Each unit was prepared to defend the other by providing mutual support. Goguryeo implemented a strategy of active defense based on cities. Besides the walled cities and fortified camps, this active defense system used small units of light cavalry to continuously harass the enemy, de-blockade units and strong reserves, consisting of the best soldiers, to strike hard at the end. Goguryeo also employed military intelligence and special tactics as an important part of the strategy. Goguryeo was good at disinformation, such as sending only stone spearheads as tribute to the Chinese court when they were in the Iron Age. Goguryeo had developed its system of espionage. One of the most famous spies, Baekseok, mentioned in the Samguk yusa, was able to infiltrate the Hwarangs of Silla. The militaristic nature of Goguryeo frequently drew them into conflicts with the dynasties of China. In the times when they are not in war with China, Goguryeo occasionally sent tributes to some of the Chinese dynasties as a form of trade and nonaggression pact. These activities of exchange promoted cultural and religious flow from China into the Korean peninsula. Goguryeo has also received tribute from other Korean kingdoms and neighboring tribal states, and frequently mobilized Malgal people in their military. Baekje and Goguryeo maintained their regional rivalry throughout their history, although they eventually formed an alliance in their wars against Silla and Tang. The culture of Goguryeo was shaped by its climate, religion, and the tense society that people dealt with due to the numerous wars Goguryeo waged. Not much is known about Goguryeo culture, as many records have been lost. Goguryeo lies a thousand li to the east of Liaodong, being contiguous with Joseon and Yemaek on the south, with Okjeo on the east, and with Buyeo on the north. They make their capital below Hwando. With a territory perhaps two thousand li on a side, their households number three myriads. They have many mountains and deep valleys and have no plains or marshes. Accommodating themselves to mountain and valley, the people make do with them for their dwellings and food. With their steep-banked rivers, they lack good fields; and though they plow and till energetically, their efforts are not enough to fill their bellies; their custom is to be sparing of food. They like to build palaces... By temperament the people are violent and take delight in brigandage... As an old saying of the Dongyi would have it, they are a separate branch of the Buyeo. And indeed there is much about their language and other things they share with the Buyeo, but in temperament and clothing there are differences. Their people delight in singing and dancing. In villages throughout the state, men and women gather in groups at nightfall for communal singing and games. They have no great storehouses, each family keeping its own small store... They rejoice in cleanliness, and they are good at brewing alcohol. When they kneel in obeisance, they extend one leg; in this they differ from the Buyeo. In moving about on foot they all run... In their public gatherings they all wear colorfully brocaded clothing and adorn themselves with gold and silver. The inhabitants of Goguryeo wore a predecessor of the modern hanbok, just as the other cultures of the three kingdoms. There are murals and artifacts that depict dancers wearing elaborate white dresses. Common pastimes among Goguryeo people were drinking, singing, or dancing. Games such as wrestling attracted curious spectators. Every October, the Dongmaeng Festival was held. The Dongmaeng Festival was practiced to worship the gods. The ceremonies were followed by huge celebratory feasts, games, and other activities. Often, the king performed rites to his ancestors. Hunting was a male activity and also served as an appropriate means to train young men for the military. Hunting parties rode on horses and hunted deer and other game with bows-and-arrows. Archery contests also occurred. A mural of a three-legged bird in a Goguryeo tomb. Goguryeo people worshipped ancestors and considered them to be supernatural. Jumong, the founder of Goguryeo, was worshipped and respected among the people. There was even a temple in Pyongyang dedicated to Jumong. At the annual Dongmaeng Festival, a religious rite was performed for Jumong, ancestors, and gods. Mythical beasts and animals were also considered to be sacred in Goguryeo. The phoenix and dragon were both worshipped, while the Samjogo, the three-legged crow that represented the sun, was considered the most powerful of the three. Paintings of mythical beasts exist in Goguryeo king tombs today. They also believed in the 'Sasin', who were 4 mythical animals. Chungryong or Chunryonga (blue dragon) guarded the east, baek-ho (white tiger) guarded the west, jujak (red phoenix (bird)) guarded the south, and hyunmu (black turtle (sometimes with snakes for a tail)) guarded the north. These mythical animals are similar to the Azure Dragon, Vermilion Bird, White Tiger, and Black Tortoise of the Four Symbols. Buddhism was first introduced to Goguryeo in 372. The government recognized and encouraged the teachings of Buddhism and many monasteries and shrines were created during Goguryeo's rule, making Goguryeo the first kingdom in the region to adopt Buddhism. However, Buddhism was much more popular in Silla and Baekje, which Goguryeo passed Buddhism to. Goguryeo art, preserved largely in tomb paintings, is noted for the vigour of its imagery. Fine detail can be seen in Goguryeo tombs and other murals. Many of the art pieces has an original style of painting. Cultural legacies of Goguryeo may be found in modern Korean culture, for example: Korean fortress, ssireum, taekkyeon, Korean dance, ondol (Goguryeo's floor heating system) and the hanbok. Remains of walled towns, fortresses, palaces, tombs, and artifacts have been found in North Korea and Manchuria, including ancient paintings in a Goguryeo tomb complex in Pyongyang. Some ruins are also still visible in present-day China, for example at Wunü Mountain, suspected to be the site of Jolbon fortress, near Huanren in Liaoning province on the present border with North Korea. Ji'an is also home to a large collection of Goguryeo era tombs, including what Chinese scholars consider to be the tombs of Gwanggaeto and his son Jangsu, as well as perhaps the best-known Goguryeo artifact, the Gwanggaeto Stele, which is one of the primary sources for pre-5th-century Goguryeo history. UNESCO added Capital Cities and Tombs of the Ancient Koguryo Kingdom in present-day China and Complex of Goguryeo Tombs in present-day North Korea to the World Heritage Sites in 2004. The modern English name "Korea" derives from Goryeo (also spelled as Koryŏ) (918–1392), which regarded itself as the legitimate successor of Goguryeo. The name Goryeo was first used during the reign of Jangsu in the 5th century. Goguryeo is also referred to as Goryeo after 520 AD in Chinese and Japanese historical and diplomatic sources. There have been some academic attempts to reconstruct the Goguryeo words based on the fragments of toponyms, recorded in the Samguk sagi, of the areas once possessed by Goguryeo. However, the reliability of the toponyms as linguistic evidence is still in dispute. Most linguistic experts on Goguryeo agree that Goguryeo was a member of the Koreanic language family. Chinese records suggest that the languages of Goguryeo, Buyeo, East Okjeo, and Gojoseon were similar, while they differed from that of the Tungusic-Malgal (Mohe). Goguryeo was traditionally viewed in ancient China as a Korean kingdom, but in modern times, the government of the People’s republic of China began to claim Goguryeo as a part of the Chinese empire rather than an independent Korean kingdom. This received heated criticisms from Korean scholars, Goguryeo experts from various countries and also some moderate Chinese scholars. Both South Korea and North Korea officially condemned China's attempt to rewrite the history of Northeast-Asia. Online discussion regarding this topic has increased. The Internet has provided a platform for a broadening participation in the discussion of Goguryeo in both South Korea and China. Thomas Chase points out that despite the growing online discussion on this subject, this has not led to a more objective treatment of this history, nor a more critical evaluation of its relationship to national identity. ^ a b North Korea claims that the country was established in 277 BC: Ministry of Foreign Affairs, North Korea. ^ "Koguryo". Encyclopædia Britannica. Retrieved June 27, 2017. ^ 조상헌 (1997). 고구려 인구에 관한 시론. ^ Barnes, Gina (2013). State Formation in Korea: Emerging Elites. ^ Byington, Mark (2016). The History and Archaeology of the Koguryo Kingdom. ^ Li, Narangoa; Cribb, Robert (2014). Historical Atlas of Northeast Asia. ^ Gardiner, Kenneth (1964). The origin and rise of the Korean kingdom of Koguryo, from the 1st century to A.D. 313 (PhD). University of London. ^ "Goguryeo". Ancient History Encyclopedia. Retrieved 2019-04-14. ^ Gardner, Hall (2007-11-27). Averting Global War: Regional Challenges, Overextension, and Options for American Strategy. Palgrave Macmillan. pp. 158–159. ISBN 9780230608733. Retrieved 15 July 2016. ^ a b c Graff, David. Medieval Chinese Warfare 300-900. Routledge. p. 200. ISBN 9781134553532. Retrieved 6 November 2016. ^ Beckwith 2007, p. 33. ^ Byington 2003, p. 234. ^ Byington 2003, p. 194. ^ Byington 2003, p. 233. ^ Aikens 1992, p. 191–196. ^ De Bary, Theodore; Peter H., Lee. Sources of Korean Tradition. Columbia University Press. pp. 7–11. ISBN 978-0231120319. ^ The National Folk Museum of Korea (South Korea) (2014). Encyclopedia of Korean Folk Literature: Encyclopedia of Korean Folklore and Traditional Culture Vol. III. 길잡이미디어. p. 41. ISBN 9788928900848. Retrieved 10 September 2017. ^ a b De Bary, Theodore; Peter H., Lee (1997). Sources of Korean Tradition. Columbia University Press. pp. 24–25. ISBN 978-0231120319. ^ Doosan Encyclopedia 유화부인 柳花夫人. Doosan Encyclopedia. ^ a b Doosan Encyclopedia 하백 河伯. Doosan Encyclopedia. ^ a b Encyclopedia of Korean Culture 하백 河伯. Encyclopedia of Korean Culture. ^ 조현설. "유화부인". Encyclopedia of Korean Folk Culture. National Folk Museum of Korea. Retrieved 30 April 2018. ^ Charles Roger Tennant (1996). A history of Korea (illustrated ed.). Kegan Paul International. p. 22. ISBN 978-0-7103-0532-9. Retrieved 9 February 2012. Wei. In 242, under King Tongch'ŏn, they attacked a Chinese fortress near the mouth of the Yalu in an attempt to cut the land route across Liao, in return for which the Wei invaded them in 244 and sacked Hwando. ^ Injae, Lee; Miller, Owen; Jinhoon, Park; Hyun-Hae, Yi (2014-12-15). Korean History in Maps. Cambridge University Press. p. 30. ISBN 9781107098466. Retrieved 10 October 2016. ^ a b c Tennant, Charles Roger (1996). A History of Korea. Routledge. p. 22. ISBN 9780710305329. Retrieved 10 October 2016. Soon after, the Wei fell to the Jin and Koguryŏ grew stronger, until in 313 they finally succeeded in occupying Lelang and bringing to an end the 400 years of China's presence in the peninsula, a period sufficient to ensure that for the next 1,500 it would remain firmly within the sphere of its culture. After the fall of the Jin in 316, the proto-Mongol Xianbei occupied the North of China, of which the Murong clan took the Shandong area, moved up to the Liao, and in 341 sacked and burned the Koguryŏ capital at Hwando. They took away some thousands of prisoners to provide cheap labour to build more walls of their own, and in 346 went on to wreak even greater destruction on Puyŏ, hastening what seems to have been a continuing migration of its people into the north-eastern area of the peninsula, but Koguryŏ, though temporarily weakened, would soon rebuild its walls and continue to expand. ^ Chinul (1991). Buswell, Robert E. (ed.). Tracing Back the Radiance: Chinul's Korean Way of Zen. Translated by Robert E. Buswell (abridged ed.). University of Hawaii Press. p. 3. ISBN 978-0824814274. Retrieved 22 April 2014. ^ Chinul (1991). Buswell, Robert E. (ed.). Tracing Back the Radiance: Chinul's Korean Way of Zen. Translated by Robert E. Buswell (abridged ed.). University of Hawaii Press. p. 4. ISBN 978-0824814274. Retrieved 22 April 2014. ^ a b Encyclopedia of World History, Vol I, P464 Three Kingdoms, Korea, Edited by Marsha E. Ackermann, Michael J. Schroeder, Janice J. Terry, Jiu-Hwa Lo Upshur, Mark F. Whitters, ISBN 978-0-8160-6386-4. ^ a b c Kim, Jinwung (2012-11-05). A History of Korea: From "Land of the Morning Calm" to States in Conflict. Indiana University Press. p. 34. ISBN 978-0253000781. Retrieved 10 October 2016. ^ a b c d e f g h Yi, Ki-baek (1984). A New History of Korea. Harvard University Press. pp. 38–40. ISBN 9780674615762. Retrieved 11 October 2016. ^ "국양왕". KOCCA. Korea Creative Content Agency. Retrieved 11 October 2016. ^ "Kings and Queens of Korea". KBS World Radio. Retrieved 10 October 2016. ^ a b Tennant, Charles Roger (1996). A History of Korea. Routledge. pp. 21–22. ISBN 9780710305329. Retrieved 10 October 2016. ^ a b c d e f g h i Kim, Jinwung (2012). A History of Korea: From "Land of the Morning Calm" to States in Conflict. Bloomington, Indiana: Indiana University Press. pp. 35–36. ISBN 978-0253000781. Retrieved 15 July 2016. ^ 김운회. "한국과 몽골, 그 천년의 비밀을 찾아서". Pressian. Korea Press Foundation. Retrieved 11 October 2016. ^ 成宇濟. "고고학자 손보기 교수". 시사저널. Retrieved 11 October 2016. ^ "[초원 실크로드를 가다](14)초원로가 한반도까지". 경향신문. The Kyunghyang Shinmun. Retrieved 11 October 2016. ^ a b Kim, Djun Kil. The History of Korea, 2nd Edition. ABC-CLIO. p. 32. ISBN 9781610695824. Retrieved 4 August 2016. ^ Walker, Hugh Dyson. East Asia: A New History. AuthorHouse. p. 137. ISBN 9781477265161. Retrieved 4 August 2016. He also conquered Sushen tribes in the northeast, Tungusic ancestors of the Jurcid and Manchus who later ruled Chinese "barbarian conquest dynasties" during the twelfth and seventeenth centuries. ^ Lee, Peter H.; Ch'oe, Yongho; Kang, Hugh H. W. Sources of Korean Tradition: Volume One: From Early Times Through the Sixteenth Century. Columbia University Press. pp. 25–26. ISBN 9780231515313. Retrieved 21 October 2016. ^ "Kings and Queens of Korea". KBS World Radio. Korea Communications Commission. Retrieved 7 October 2016. ^ Lee, Ki-Baik (1984). A New History of Korea. Cambridge, Massachusetts: Harvard University Press. pp. 38–40. ISBN 978-0674615762. "This move from a region of narrow mountain valleys to a broad riverine plain indicates that the capital could no longer remain primarily a military encampment but had to be developed into a metropolitan center for the nation's political, economic, and social life." ^ Kim, Jinwung (2012-11-05). A History of Korea: From "Land of the Morning Calm" to States in Conflict. Indiana University Press. p. 36. ISBN 978-0253000781. Retrieved 15 July 2016. "Because Pyongyang was located in the vast, fertile Taedong River basin and had been the center of advanced culture of Old Chosŏn and Nangnang, this move led Koguryŏ to attain a high level of economic and cultural prosperity." ^ 한나절에 읽는 백제의 역사 (in Korean). ebookspub(이북스펍). 2014-10-04. ISBN 9791155191965. Retrieved 16 November 2016. ^ Lee, Ki-Baik (1984). A New History of Korea. Cambridge, Massachusetts: Harvard University Press. pp. 38–40. ISBN 978-0674615762. ^ Walker, Hugh Dyson (November 2012). East Asia: A New History. AuthorHouse. p. 137. ISBN 9781477265161. Retrieved 29 July 2016. ^ Yi, Ki-baek (1984). A New History of Korea. Harvard University Press. p. 47. ISBN 9780674615762. Retrieved 16 November 2016. ^ a b White, Matthew (2011-11-07). Atrocities: The 100 Deadliest Episodes in Human History. W. W. Norton & Company. pp. 78–79. ISBN 9780393081923. Retrieved 16 November 2016. ^ Bedeski, Robert (2007-03-12). Human Security and the Chinese State: Historical Transformations and the Modern Quest for Sovereignty. Routledge. p. 90. ISBN 9781134125975. Retrieved 16 November 2016. ^ Ebrey, Patricia Buckley; Walthall, Anne; Palais, James B. (2013). East Asia: A Cultural, Social, and Political History, Volume I: To 1800. Cengage Learning. p. 106. ISBN 978-1111808150. Retrieved 16 November 2016. ^ a b Graff, David (2003-09-02). Medieval Chinese Warfare 300-900. Routledge. p. 196. ISBN 9781134553532. Retrieved 3 November 2016. ^ Yi, Ki-baek (1984). A New History of Korea. Harvard University Press. p. 48. ISBN 9780674615762. Retrieved 2 November 2016. ^ a b Kim, Jinwung (2012-11-05). A History of Korea: From "Land of the Morning Calm" to States in Conflict. Indiana University Press. p. 50. ISBN 978-0253000781. Retrieved 2 August 2016. ^ Ebrey, Patricia Buckley; Walthall, Anne; Palais, James B. (2013). East Asia: A Cultural, Social, and Political History, Volume I: To 1800. Cengage Learning. p. 106. ISBN 978-1111808150. Retrieved 4 August 2016. ^ Tucker, Spencer C. (2009-12-23). A Global Chronology of Conflict: From the Ancient World to the Modern Middle East [6 volumes]: From the Ancient World to the Modern Middle East. ABC-CLIO. p. 406. ISBN 9781851096725. Retrieved 4 August 2016. ^ a b Chen, Jack Wei (2010). The Poetics of Sovereignty: On Emperor Taizong of the Tang Dynasty. Harvard University Press. p. 43. ISBN 9780674056084. Retrieved 4 August 2016. ^ Guo, Rongxing (2009-08-29). Intercultural Economic Analysis: Theory and Method. Springer Science & Business Media. p. 42. ISBN 9781441908490. Retrieved 4 August 2016. ^ a b Ring, Trudy; Watson, Noelle; Schellinger, Paul (2012-11-12). Asia and Oceania: International Dictionary of Historic Places. Routledge. p. 486. ISBN 9781136639791. Retrieved 16 July 2016. ^ Injae, Lee; Miller, Owen; Jinhoon, Park; Hyun-Hae, Yi (2014-12-15). Korean History in Maps. Cambridge University Press. p. 29. ISBN 9781107098466. Retrieved 4 August 2016. ^ 이희진. 옆으로 읽는 동아시아 삼국지 1 (in Korean). EASTASIA. ISBN 9788962620726. Retrieved 4 November 2016. ^ "통일기". 한국콘텐츠진흥원. Korea Creative Content Agency. Retrieved 4 November 2016. ^ 김용만. 고구려의발견: 새로쓰는고구려문명사 (in Korean). 바다출판사. p. 486. ISBN 9788987180212. Retrieved 4 November 2016. ^ a b c Yi, Ki-baek. A New History of Korea. Harvard University Press. p. 67. ISBN 9780674615762. Retrieved 2 August 2016. ^ Graff, David. Medieval Chinese Warfare 300-900. Routledge. p. 213. ISBN 9781134553532. Retrieved 29 July 2016. ^ Grant, Reg G. 1001 Battles That Changed the Course of World History. Universe Pub. p. 118. ISBN 9780789322333. Retrieved 29 July 2016. ^ Starr, S. Frederick. Xinjiang: China's Muslim Borderland. Routledge. p. 38. ISBN 9781317451372. Retrieved 29 July 2016. ^ Connolly, Peter; Gillingham, John; Lazenby, John. The Hutchinson Dictionary of Ancient and Medieval Warfare. Routledge. ISBN 9781135936815. Retrieved 29 July 2016. ^ Neelis, Jason. Early Buddhist Transmission and Trade Networks: Mobility and Exchange Within and Beyond the Northwestern Borderlands of South Asia. BRILL. p. 176. ISBN 978-9004181595. Retrieved 29 July 2016. ^ 이상각 (2014). 고려사 - 열정과 자존의 오백년 (in Korean). 들녘. ISBN 9791159250248. Retrieved 23 March 2018. ^ "(2) 건국―호족들과의 제휴". 우리역사넷 (in Korean). National Institute of Korean History. Retrieved 23 March 2018. ^ 성기환 (2008). 생각하는 한국사 2: 고려시대부터 조선·일제강점까지 (in Korean). 버들미디어. ISBN 9788986982923. Retrieved 23 March 2018. ^ 박, 종기. 고려사의 재발견: 한반도 역사상 가장 개방적이고 역동적인 500년 고려 역사를 만나다 (in Korean). 휴머니스트. ISBN 9788958629023. Retrieved 27 October 2016. ^ a b Yi, Ki-baek. A New History of Korea. Harvard University Press. p. 103. ISBN 9780674615762. Retrieved 20 October 2016. ^ a b c Rossabi, Morris. China Among Equals: The Middle Kingdom and Its Neighbors, 10th-14th Centuries. University of California Press. p. 323. ISBN 9780520045620. Retrieved 1 August 2016. ^ a b Kim, Djun Kil. The History of Korea. ABC-CLIO. p. 57. ISBN 9780313038532. Retrieved 20 October 2016. ^ a b Grayson, James H. Korea - A Religious History. Routledge. p. 79. ISBN 9781136869259. Retrieved 20 October 2016. ^ 박종기 (2015). 고려사의 재발견: 한반도 역사상 가장 개방적이고 역동적인 500년 고려 역사를 만나다 (in Korean). 휴머니스트. ISBN 9788958629023. Retrieved 23 March 2018. ^ 박용운. "'고구려'와 '고려'는 같은 나라였다". 조선닷컴. Chosun Ilbo. Archived from the original on 22 June 2017. Retrieved 23 March 2018. ^ Lee, Ki-Baik (1984). A New History of Korea. Cambridge, Massachusetts: Harvard University Press. p. 103. ISBN 978-0674615762. "When Parhae perished at the hands of the Khitan around this same time, much of its ruling class, who were of Koguryŏ descent, fled to Koryŏ. Wang Kŏn warmly welcomed them and generously gave them land. Along with bestowing the name Wang Kye ("Successor of the Royal Wang") on the Parhae crown prince, Tae Kwang-hyŏn, Wang Kŏn entered his name in the royal household register, thus clearly conveying the idea that they belonged to the same lineage, and also had rituals performed in honor of his progenitor. Thus Koryŏ achieved a true national unification that embraced not only the Later Three Kingdoms but even survivors of Koguryŏ lineage from the Parhae kingdom." ^ Yi, Ki-baek. A New History of Korea. Harvard University Press. pp. 23–24. ISBN 9780674615762. Retrieved 21 November 2016. ^ 신형식 (2003). 高句麗史 (in Korean). Ewha Womans University Press. p. 56. ISBN 9788973005284. Retrieved 12 September 2017. ^ 이덕일; 박찬규 (2007). 고구려 는 천자 의 제국 이었다 (in Korean). 역사의아침. ISBN 9788995884973. Retrieved 12 September 2017. ^ "고구려 5부 (高句麗 五部)". 한국사 콘텐츠. National Institute of Korean History. Retrieved 21 November 2016. ^ 한국사 전쟁의 기술: 한국사의 판도를 바꿔 놓은 36가지 책략 (in Korean). Dasan Books. 2010-07-28. p. 61. ISBN 9788963704067. Retrieved 21 November 2016. ^ 고구려와 수나라의 전쟁 (in Korean). ebookspub(이북스펍). 2014-03-07. p. 26. ISBN 9791155191330. Retrieved 21 November 2016. ^ "2000 years old Korean Hwando picture". ^ Lee 1992, p. 16-17. ^ "The Pride History of Korea". Archived from the original on 2007-05-28. ^ "'고구려'와 '고려'는 같은 나라였다 - 조선닷컴". www.chosun.com. Archived from the original on 2011-06-11. Retrieved 2010-01-09. ^ "고구려란 이름". Archived from the original on 2008-08-29. ^ Vovin, Alexander (2013). "From Koguryo to Tamna: Slowly riding to the South with speakers of Proto-Korean". Korean Linguistics. 15 (2): 222–240. ^ Lee, Ki-Moon; Ramsey, S. Robert (2011). A History of the Korean language. Cambridge: Cambridge University Press. ISBN 978-0-521-66189-8. ^ Whitman, John (2011). "Northeast Asian Linguistic Ecology and the Advent of Rice Agriculture in Korea and Japan". Rice. 4 (3–4): 149–158. doi:10.1007/s12284-011-9080-0. ^ Unger, J. Marshall (2009). The role of contact in the origins of the Japanese and Korean languages. Honolulu: University of Hawaii Press. ISBN 978-0-8248-3279-7. ^ Bae, Young-dae; Min-a Lee (2004-09-16). "Korea finds some allies in Goguryeo history spat". Joongang Ilbo. Retrieved 2007-03-06. ^ "Asia Times - News and analysis from Korea; North and South". www.atimes.com. ^ Chase, Thomas (2011). "Nationalism on the Net: Online discussion of Goguryeo history in China and South Korea". China Information. 25 (1): 61–82. Archived from the original on 2012-05-13. Retrieved 2012-08-23. Beckwith, Christopher I. (2007). Koguryo: The Language of Japan's Continental Relatives: An Introduction to the Historical-Comparative Study of the Japanese-Koguryoic Languages, with a Preliminary Description of Archaic Northeastern Middle Chinese (Second ed.). BRILL. ISBN 978-90-474-2028-6. Pozzi, Alessandra; Janhunen, Juha Antero; Weiers, Michael, eds. (2006). Tumen Jalafun Jecen Aku: Manchu Studies in Honour of Giovanni Stary. Volume 20 of Tunguso Sibirica. Giovanni Stary (Contributor). Otto Harrassowitz Verlag. ISBN 978-3447053785. Retrieved 1 April 2013. Byeon, Tae-seop (1999). 韓國史通論 (Outline of Korean history), 4th ed. Unknown Publisher. ISBN 978-89-445-9101-3. Rhee, Song nai (1992) Secondary State Formation: The Case of Koguryo State. In Aikens, C. Melvin (1992). Pacific northeast Asia in prehistory: hunter-fisher-gatherers, farmers, and sociopolitical elites. WSU Press. ISBN 978-0-87422-092-6. Baekje (백제; 百濟; [pɛk̚.t͈ɕe] (also Paekche); 18 BC – 660 AD) was a kingdom located in southwestern Korea. It was one of the Three Kingdoms of Korea, together with Goguryeo and Silla. Baekje alternately battled and allied with Goguryeo and Silla as the three kingdoms expanded control over the peninsula. At its peak in the 4th century, Baekje controlled most of the western Korean peninsula, as far north as Pyongyang, and may have even held territories in China, such as in Liaoxi, though this view is controversial. It became a significant regional sea power, with political and trade relations with China and Japan. Baekje was a great maritime power; its nautical skill, which made it the Phoenicia of East Asia, was instrumental in the dissemination of Buddhism throughout East Asia and continental culture to Japan.In 660 it was defeated, by an alliance of Silla and the Chinese Tang Dynasty, and submitted to Unified Silla. Balhae (698–926) was a multi-ethnic kingdom in Manchuria, Korean peninsula and Primorsky Krai. Balhae was established by refugees from the fallen Korean kingdom of Goguryeo and Tungusic Mohe tribes in 698, when the first king, Dae Joyeong, defeated Chinese Wu China at Tianmenling.Balhae's original capital was at Dongmo Mountain in modern Dunhua, Jilin Province. In 742 it was moved to the Central Capital in Helong, Jilin. It was moved to the Northern Capital in Ning'an, Heilongjiang in 755, to the Eastern Capital in Hunchun, Jilin in 785, and back to the Northern Capital in 794. Along with Goguryeo refugees and Mohe tribes, Balhae had a diverse population, including other minorities such as Khitan, Evenk and Yilou peoples. Balhae had a high level of craftsmanship and engaged in trade with neighboring countries such as Göktürk, Japan, Silla and Tang.In 926, the Khitan Liao dynasty conquered Balhae and established the autonomous kingdom of Dongdan ruled by the Liao crown prince Yelü Bei, which was soon absorbed into the Liao. Meanwhile, a series of nobilities and elites led by key figures such as crown prince Dae Gwang-hyeon, were absorbed into Goryeo. According to a Chinese source, the kingdom had 100,000 households and a population of about 500,000. Archaeological evidence suggests that the Balhae culture was an amalgamation of Chinese, Korean, and indigenous cultures. Bojang of Goguryeo (died 682) (r. 642–668) was the 28th and last monarch of Goguryeo the northernmost of the Three Kingdoms of Korea. He was placed on the throne by the military leader Yeon Gaesomun. His reign ended when Goguryeo fell to the allied forces of the southern Korean kingdom of Silla and the Chinese Tang Dynasty. Buyeo, or Puyŏ (Korean: 부여; Hanja: 夫餘 Korean pronunciation: [pu.jʌ]), was an ancient kingdom centred around the middle of Jilin province in Manchuria and existing as an independent polity from before the late 2nd century BC to the mid-4th century AD.The state entered into formal diplomatic relations with the Eastern Han dynasty by the mid-1st century AD as an important ally of that empire to check the Xianbei and Goguryeo threats. After an incapacitating Xianbei invasion in 285, Buyeo was restored with help from the Jin dynasty. This, however, marked the beginning of a period of decline. A second Xianbei invasion in 346 finally destroyed the state, except some remnants in its core region which survived as vassals of Goguryeo until their final annexation in 494. Both Goguryeo and Baekje, two of the Three Kingdoms of Korea, considered itself Buyeo's successor. King Dongmyeong of Goguryeo (58 BCE – 19 BCE, r. 37 BCE – 19 BCE) or Dongmyeongseongwang (Hangul: 동명성왕; Hanja: 東明聖王), which literally means Holy King of the East, also known by his birth name Jumong (Hangul: 주몽; Hanja: 朱蒙), was the founding monarch of the kingdom of Goguryeo, the northernmost of the Three Kingdoms of Korea. In the Gwanggaeto Stele, he is called Chumo-wang (King Chumo). In the Samguk Sagi and the Samgungnyusa, he is recorded as Jumong with the surname Go (Hanja: 高). The Samguk Sagi states that he was also known as Chumo or Sanghae (Hangul: 상해; Hanja: 象解). The name is also transcribed in other records as Chumong (Hangul: 추몽; Hanja: 鄒蒙), Jungmo (Hangul: 중모; Hanja: 中牟 or hanja: 仲牟), or Domo (Hangul: 도모; Hanja: 都牟). Goguryeo tombs, officially known as the Complex of Koguryo Tombs, are tombs in North Korea. In July 2004, they became the first UNESCO World Heritage site in the country. The site consists of 30 individual tombs from the later Goguryeo kingdom, one of Three Kingdoms of Korea, located in the cities of P'yŏngyang and Namp'o. Goguryeo was one of the strongest Korean kingdoms in northeastern China and the Korean Peninsula from 37 BCE to the 7th century CE. The kingdom was founded in the present day area of North Korea, and part of Manchuria around 37 BCE, and the capital was transferred to P'yŏngyang in 427 CE. Many of the tombs, such as the Anak Tomb No. 3, have wall paintings. The tombs are almost all that remains from this culture. There are over 10,000 Goguryeo tombs overall, but only about 90 of those unearthed in China and Korea have wall paintings. The Complex of Goguryeo Tombs inscribed on the World Heritage List contains the majority of these tombs with wall paintings. It is thought that the complex was used as a burial site for kings, queens and other members of the royal family. The paintings found on the tombs offer a unique insight into the everyday life of the Goguryeo period. The group includes the Tomb of King Tongmyong. The murals are strongly coloured and show daily life and Korean mythologies of the time. By 2005, 70 murals had been found, mostly in the Taedong river basin near Pyongyang, the Anak area in South Hwanghae province, and in Ji'an in China's Jilin province. The wall paintings are masterpieces of the Goguryeo period. The tombs themselves reflect ingenious engineering capabilities. The site offers exceptional insights into the Goguryeo culture, both into everyday life and burial customs. The Goguryeo tombs are an important example of this burial typology.In May 2006, 2,360 individual tombs were discovered at the site of the ancient Goguryeo kingdom during work on the Yunfeng Reservoir. Ruins of an ancient city were discovered as well. Among the ruins was a city wall that was 1.5 meters tall and four meters wide. Evidence also suggested the presence of a moat. A dozen tombs were found within the city. The Goguryeo–Sui War were a series of invasions launched by the Sui dynasty of China against Goguryeo, one of the Three Kingdoms of Korea, between AD 598 and AD 614. It resulted in the defeat of the Sui and was one of the pivotal factors in the collapse of the dynasty, which led to its overthrow by the Tang dynasty in AD 618. The Goguryeo–Tang War occurred from 645 to 668 and was initially fought between the Goguryeo kingdom and Tang empire. During the course of the war the two sides allied with various other states. Goguryeo successfully repulsed the invading Tang armies during the first Tang invasions of 645-648. After conquering Baekje in 660, Tang and Silla armies invaded Goguryeo from the north and south in 661, but were forced to withdraw in 662. In 666, Yeon Gaesomun died and Goguryeo became plagued by violent dissension, numerous defections, and widespread demoralization. The Tang–Silla alliance mounted a fresh invasion in the following year, aided by the defector Yeon Namsaeng. In late 668, exhausted from numerous attacks and suffering from internal political chaos, the kingdom of Goguryeo and the remnants of Baekje army succumbed to the numerically superior armies of the Tang Dynasty and Silla. The war marked the end of the Three Kingdoms of Korea period which had lasted since 57 BCE. It also triggered the Silla–Tang War during which the Silla kingdom and the Tang empire fought over the spoils they had gained. Gwanggaeto the Great (374–413, r. 391–413) was the nineteenth monarch of Goguryeo. His full posthumous name means "Entombed in Gukgangsang, Broad Expander of Domain, Peacemaker, Supreme King", sometimes abbreviated to Hotaewang. His era name is Yeongnak and he is occasionally recorded as Yeongnak Taewang ("Supreme King" or "Emperor" Yeongnak). Gwanggaeto's imperial reign title meant that Goguryeo was on equal standing as an empire with the imperial dynasties in China.Under Gwanggaeto, Goguryeo began a golden age, becoming a powerful empire and one of the great powers in East Asia. Gwanggaeto made enormous advances and conquests into: Western Manchuria against Khitan tribes; Inner Mongolia and the Maritime Province of Russia against numerous nations and tribes; and the Han River valley in central Korea to control over two-thirds of the Korean peninsula.In regard to the Korean peninsula, Gwanggaeto defeated Baekje, the then most powerful of the Three Kingdoms of Korea, in 396, capturing the capital city of Wiryeseong in present-day Seoul. In 399, Silla, the southeastern kingdom of Korea, sought aid from Goguryeo due to incursions by Baekje troops and their Wa allies from the Japanese archipelago. Gwanggaeto dispatched 50,000 expeditionary troops, crushing his enemies and securing Silla as a de facto protectorate; he thus subdued the other Korean kingdoms and achieved a loose unification of the Korean peninsula under Goguryeo. In his western campaigns, he defeated the Xianbei of the Later Yan empire and conquered the Liaodong peninsula, regaining the ancient domain of Gojoseon.Gwanggaeto's accomplishments are recorded on the Gwanggaeto Stele, erected in 414 at the supposed site of his tomb in Ji'an along the present-day China–North Korea border. Constructed by his son and successor Jangsu, the monument to Gwanggaeto the Great is the largest engraved stele in the world. The Lower Paleolithic era in the Korean Peninsula and Manchuria began roughly half a million years ago. The earliest known Korean pottery dates to around 8000 BCE, and the Neolithic period began after 6000 BCE, followed by the Bronze Age by 2000 BCE, and the Iron Age around 700 BCE. According to the mythic account recounted in the Samguk yusa, the Gojoseon (Old Joseon) kingdom was founded in northern Korea and southern Manchuria in 2333 BCE.The Gija Joseon state was purportedly founded in 12th century BCE. Its existence and role has been controversial in the modern era, and seen as likely mythology. The first written historical record on Gojoseon can be found from the early 7th century BCE. The Jin state was formed in southern Korea by the 3rd century BCE. In the 2nd century BCE, Gija Joseon was replaced by Wiman Joseon, which fell to the Han dynasty of China near the end of the century. This resulted in the fall of Gojoseon and led to succeeding warring states, the Proto–Three Kingdoms period that spanned the later Iron Age. From the 1st century, Goguryeo, Baekje, and Silla grew to control the peninsula and Manchuria as the Three Kingdoms of Korea (57 BCE–668 CE), until unification by Silla in 676. In 698, Go of Balhae established the Kingdom of Balhae (c.f. modern Bohai Sea) in old territories of Goguryeo, which led to the North–South States Period (698–926) of Balhae and Silla coexisting. In the late 9th century, Silla was divided into the Later Three Kingdoms (892–936), which ended with the unification by Wang Geon's Goryeo dynasty. Meanwhile, Balhae fell after invasions by the Khitan Liao dynasty and the refugees including the last crown prince emigrated to Goryeo, where the crown prince was warmly welcomed and included into the ruling family by Wang Geon, thus unifying the two successor states of Goguryeo. During the Goryeo period, laws were codified, a civil service system was introduced, and culture influenced by Buddhism flourished. However, Mongol invasions in the 13th century brought Goryeo under its influence until the mid-14th century.In 1392, General Yi Seong-gye established the Joseon dynasty (1392–1910) after a coup d'état that overthrew the Goryeo dynasty in 1388. King Sejong the Great (1418–1450) implemented numerous administrative, social, scientific, and economic reforms, established royal authority in the early years of the dynasty, and is attributed with creating Hangul, the Korean alphabet. After enjoying a period of peace for nearly two centuries, the Joseon dynasty faced foreign invasions and internal factional strife from 1592 to 1637. Most notable of these invasions is the Japanese invasions of Korea, which marked the end of the Joseon dynasty's early period. The combined force of Ming dynasty of China and the Joseon dynasty repelled these Japanese invasions, but at cost to the countries. Henceforth, Joseon gradually became more and more isolationist and stagnant. By the mid 19th century, with the country unwilling to modernize, and under encroachment of European powers, Joseon Korea was forced to sign unequal treaties with foreign powers. After the assassination of Empress Myeongseong in 1895, the Donghak Peasant Revolution, and the Gabo Reforms of 1894 to 1896, the Korean Empire (1897–1910) came into existence, heralding a brief but rapid period of social reform and modernization. However, in 1905, the Korean Empire signed a protectorate treaty and in 1910, Japan annexed the Korean Empire. Korean resistance manifested in the widespread nonviolent March 1st Movement of 1919. Thereafter the resistance movements, coordinated by the Provisional Government of the Republic of Korea in exile, became largely active in neighboring Manchuria, China, and Siberia, influenced by Korea's peaceful demonstrations. Figures from these exile organizations would become important in post-WWII Korea. After the end of World War II in 1945, the Allies divided the country into a northern area (protected by the Soviets) and a southern area (protected primarily by the United States). In 1948, when the powers failed to agree on the formation of a single government, this partition became the modern states of North and South Korea. The peninsula was divided at the 38th Parallel: the "Republic of Korea" was created in the south, with the backing of the US and Western Europe, and the "Democratic People's Republic of Korea" in the north, with the backing of the Soviets and the communist People's Republic of China. The new premier of North Korea, Kim il-Sung, launched the Korean War in 1950 in an attempt to reunify the country under Communist rule. After immense material and human destruction, the conflict ended with a cease-fire in 1953. In 2018, the two nations agreed to work toward a final settlement to formally end the Korean War. In 1991, both states were accepted into the United Nations. While both countries were essentially under military rule after the war, South Korea eventually liberalized. Since 1987 it has had a competitive electoral system. The South Korean economy has prospered, and the country is now considered to be fully developed, with a similar capital economic standing to Western Europe, Japan, and the United States. North Korea has maintained a militarized dictatorship rule, with a cult of personality constructed around the Kim family. Economically, North Korea has remained heavily dependent on foreign aid. Following the collapse of the Soviet Union, that aid fell precipitously. The country's economic situation has been quite marginal since. This is a list of monarchs of Korea, arranged by dynasty. Names are romanized according to the South Korean Revised Romanization of Korean. McCune-Reischauer romanizations may be found at the articles about the individual monarchs. The military history of Goguryeo involves wars with other Korean kingdoms, Chinese dynasties, nomadic states and tribes, and Wa Japan. Goguryeo was a highly militaristic state; it was a powerful empire and one of the great powers in East Asia, until it was defeated by a Silla–Tang alliance in 668 after prolonged exhaustion and internal strife caused by the death of Yeon Gaesomun. Korea's military history spans thousands of years, beginning with the ancient nation of Gojoseon and continuing into the present day with the countries of North Korea and South Korea, and is notable for its many successful triumphs over invaders. Throughout its history, Korea has boasted numerous exceptional leaders who gained outstanding victories against numerically superior enemies. Famed leaders credited with defending Korea against foreign invasions include: Eulji Mundeok of Goguryeo, who defeated Sui China during the Goguryeo–Sui War; Yeon Gaesomun of Goguryeo, who defeated Emperor Taizong of Tang China during the Goguryeo–Tang War; Gang Gam-chan of Goryeo, who defeated the Khitan Empire during the Goryeo-Khitan War; Choe Yeong and Yi Seong-gye of Goryeo, who defeated the Red Turbans, who later established Ming China, during the Red Turban Invasions; and Yi Sun-shin of Joseon, who defeated the Japanese at sea during the Imjin War. Other notable leaders include: Gwanggaeto the Great of Goguryeo, who created a great empire in Northeast Asia through conquest, and subjugated the other Korean kingdoms of Baekje, Silla and Gaya to bring about a brief unification of the Three Kingdoms of Korea; Geunchogo of Baekje, who captured Pyongyang and established overseas territories to control much of the Korean peninsula and dominate the seas; Munmu and Kim Yu-sin of Silla, who united the Three Kingdoms of Korea and defeated Tang China to gain complete control of the Korean peninsula; Dae Jo-yeong, who created Balhae from Goguryeo's ashes and reconquered Goguryeo lands lost during the Goguryeo-Tang War; Jang Bogo of Later Silla, who created a maritime empire and commanded a powerful fleet; Wang Geon, who united the Later Three Kingdoms of Korea and established Goryeo as the successor to Goguryeo; and Yun Gwan of Goryeo, who defeated the Jurchens and constructed nine fortresses in Manchuria.Today, both North Korea and South Korea field some of the largest and most lethal armies in the world. On one hand, North Korea is widely suspected of having nuclear weapons, as well as other weapons of mass destruction. South Korea, for its part, is equipped with a sophisticated conventional military with state-of-the-art weapons. In addition, South Korean troops actively participated in the Vietnam War, contributing the second largest foreign military contingent after the United States, and are currently serving in various UN peacekeeping missions around the world. The South Korean military enjoys military alliances with other countries, particularly the United States. Silla (57 BC – 935 AD) (Hangul: 신라; Hanja: 新羅; RR: Silla Korean pronunciation: [ɕil.la]) was a kingdom located in southern and central parts of the Korean Peninsula. Silla, along with Baekje and Goguryeo, formed the Three Kingdoms of Korea. Founded by Hyeokgeose of Silla, of the Park family, the Korean dynasty was ruled by the Gyeongju Gim (Kim) (김, 金) clan for 586 years, Miryang Park (Bak) (박, 朴) clan for 232 years, Seok clan for 172 years. It began as a chiefdom in the Samhan confederacies, once allied with Sui China and then Tang China, until it eventually conquered the other two kingdoms, Baekje in 660 and Goguryeo in 668. Thereafter, Later Silla occupied most of the Korean Peninsula, while the northern part re-emerged as Balhae, a successor-state of Goguryeo. After nearly 1,000 years of rule, Silla fragmented into the brief Later Three Kingdoms of Silla, Later Baekje, and Taebong, handing over power to Goryeo in 935. Taebong (Hangul: 태봉; Hanja: 泰封; RR: Tebong; Korean pronunciation: [tʰɛ.boŋ]) was a state established by Gung Ye (hanja: 弓裔) on the Korean Peninsula in 901 during the Later Three Kingdoms. The Three Kingdoms of Korea (Hangul: 삼국시대; Hanja: 三國時代) refers to the three kingdoms of Baekje (백제, 百濟), Silla (신라, 新羅) and Goguryeo (고구려, 高句麗). Goguryeo was later known as Goryeo (고려, 高麗), from which the modern name Korea is derived. The Three Kingdoms period is defined as being from 57 BC to 668 AD (but there existed about 78 tribal states in the southern region of the Korean peninsula and relatively big states like Okjeo, Buyeo, and Dongye in its northern part and Manchuria). The three kingdoms occupied the entire Korean Peninsula and roughly half of Manchuria, located in present-day China and Russia . The kingdoms of Baekje and Silla dominated the southern half of the Korean Peninsula and Tamna, whereas Goguryeo controlled the Liaodong Peninsula, Manchuria and the northern half of the Korean Peninsula. Baekje and Goguryeo shared founding myths and originated from Buyeo.In the 7th century, allied with China under the Tang dynasty, Silla unified the Korean Peninsula for the first time in Korean history, forming a united Korean national identity for the first time. After the fall of Baekje and Goguryeo, the Tang dynasty established a short-lived military government to administer parts of the Korean peninsula. However, as a result of the Silla–Tang War (≈670–676), Silla forces expelled the Protectorate armies from the peninsula in 676. The following period is known as the Unified Silla or Later Silla (668–935). Subsequently, Go of Balhae, a former Goguryeo general, founded Balhae in the former territory of Goguryeo after defeating the Tang dynasty at the Battle of Tianmenling. The predecessor period, before the development of the full-fledged kingdoms, is sometimes called Proto–Three Kingdoms period. Main primary sources for this period include Samguk sagi and Samguk yusa in Korea, and the "Eastern Barbarians" section (東夷傳) from the Book of Wei (魏書) of the Records of the Three Kingdoms in China. This is a timeline of the history of Korea. Some dates prior to the 5th century are speculative or approximate.